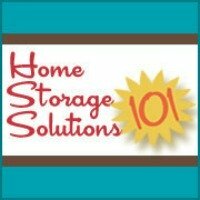 When you've got a large family, either with lots of kids, or lots of people living in the household, you know one thing -- there are lots of loads of laundry. I have always been fascinated by big families, since when they have their households working like clockwork, and still have time for love and laughter, I think the rest of us should take note since it will probably work for us too! I myself have three kids, so I know a thing or two about laundry, but the ladies who have shared their laundry schedules and routines below all have six or more kids, or a large household where they are responsible for overseeing the laundry. Some of them have elaborate weekly systems, others work on it daily, and others supervise the chores done by their kids. There is no one right way, since if it works, its right. On the other hand if it doesn't work, it is wrong since its not getting everyone clean clothes on a regular basis, while still allowing time for other activities in the home. Don't sweat it, if you're struggling - just try some of the ideas below until you find what works for you. So for everyone wishing for ideas and methods for how to keep up with lots of loads of laundry, whether you have a large family or not, take note of what works for these women to get some ideas of your own! Further, if you've got a laundry schedule thats working for you (whether you've got a large family or not) I'd love to hear it. You can share your own laundry routine here, to help us all get more ideas of what could work for us. I'll share the best one here on the site. 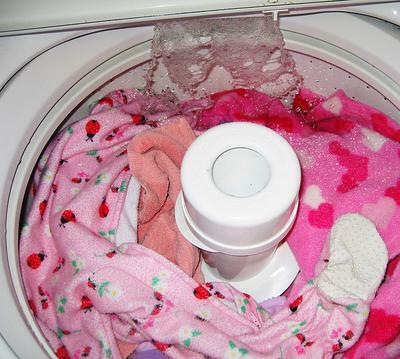 In addition, be sure to check out my article on making a weekly laundry schedule that works for you, for more ideas and guidance on this important subject in household management. Now, scroll on down to read different schedules from large families, and get ideas for yourself! Gloria doesn't wash all her kids clothes, but only some of them. 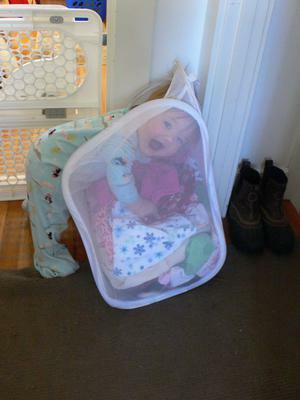 I have suggested that where you keep your laundry baskets in your home should depend on who is going to end up washing the clothes. She has chosen a good strategy for how to make it most efficient for the person washing the clothes to have access to the dirty ones they are going to wash.
sort the clothes as they go, which is a great time-saving technique. I have six kids, two of whom are still in diapers, plus myself and my husband in our home. The two oldest children do their own laundry, so they have their own laundry baskets in their own rooms. For everyone else, I do two loads a day, at least. All the rest of us put our dirty clothes each morning and evening in central laundry baskets in the laundry room. We also have a diaper pail in the laundry room and a place for kitchen rags in there. I do my laundry by the days of the week. After the clothes are clean and dry I fold them and each person that is old enough puts away their own clothes, and I put away the rest. Thanks for sharing you laundry routine Gloria. You've definitely found a good system that works for you. Remember as you read more of the schedules shared below that if you've got a routine of your own, you can share it with me! I'd love to hear it. Click here to share your laundry routine now. 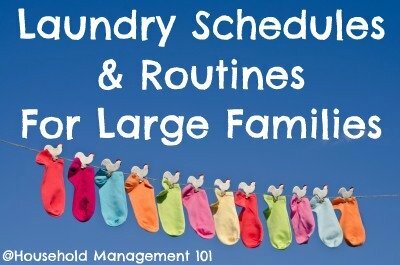 Every household manager needs to figure out a schedule for getting the laundry done that works for their family. I found this family's laundry schedule recently on the web, and wanted to share it with you. It is a family of 8, with 6 kids ages 11 to 1. What has worked for this Mom of 6 is to give each person a laundry basket for their room, and then also assign each person a laundry day. Doing each person's laundry separately makes it easier for her to know whose clothes are whose, so it is easier to return them to their rightful owner at the end of the laundry cycle. I generally recommend that when you have small kids that you don't need laundry baskets in each persons' room, and to wash all the clothes together because you can sort laundry into big enough loads easier. She has done the exact opposite -- but it works for her, so I say go for it! 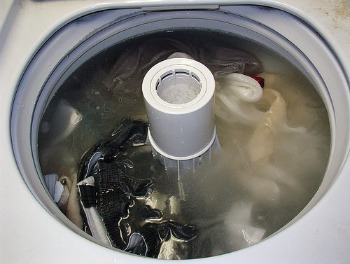 There is more than one way to get your laundry in order, and no way is right or wrong. What matters is whether it works for you. To see this Mom of 6's full plan for laundry organization check out Simply Grand Central. She also has a great tip on how she got rid of her dressers to better organize all her kids clothes. Here is Tammie's weekly laundry plan in her house with seven people that she has graciously shared with us. All clean socks and undies get put into 1 laundry basket to be sorted and mated each night as we watch a movie together. I am a stay at home mom and like others extremely busy. We have 3 children (2 teens and a tween), and my elderly mom in law who is bedridden, my sister in law who is mentally challenged (and loves doing laundry :) ), 2 dogs, a cat and 2 fish, not to mention me and hubby. Once a month I wash all curtains in the house. I never do laundry on Sundays because that's our family day. 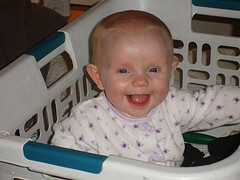 Tammie, thanks for sharing your family's weekly laundry plan with me. With such a large household it is great that you have such an asset in your sister in law, who can help you with the laundry. I'm seeing a trend with laundry schedules and routines for large families, which is that you can do it by yourself, if you have to, such as when your kids are very young, but if you can get help, you should. There is no reason that others in the household who are old enough, or capable enough, cannot help! As a mother of NINE I do quite a few loads a week. I have a 14 year old, Natalee, who is in charge of how many loads each kid does a week, usually, my girls do more than the boys. I have 2 that DON'T do the laundry but occasionally help my 2nd oldest daughter fold. The kids that don't do it are Mallory, 3, and Max 4. My youngest that DOES laundry is Kaitlynne and she's 6. Each child does at least 2 loads a week and is in the room at least 8 times a week if its either to clean bathrooms, wash hands before dinner or do the laundry or iron or even fold. So the kids are very busy. My oldest 3 do dinner and the next 3 set the table. Nat, Shawn, and Anna (14, 13, 11) make dinner while Austin (9), Sarah (8) and Owen (6) set the table often helped by Katie (6) she also does breakfast alongside of Max and Anna. Anna is the helper of the family. She helps the little ones do their part of the family and do the elementaries do their homework and she gets help from Nat. My family is usually chaos but when they are to work its GREAT! Also each child has their own color and when they take their laundry down to the room they dump it in their bucket. Only the older ones have a bucket and basket. So, Nat; yellow, Shawn; brown, Anna; green, Austin; blue, Sarah; purple, Owen; red, Katie; pink, Max; black, and little Mal; orange. I have 4 boys, and twin toddler girls, with one on the way at the beginning of next year. 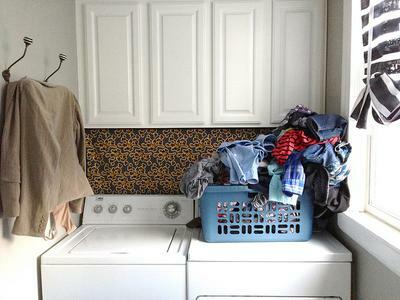 I have found that if I stick to two batches of laundry a day (at least) I never get TOO behind, plus I don't plan on doing any laundry on the weekend. I try to cloth diaper my youngest 2-3 to help save money. I am a SAHM with seven kids, ages 17 down to 3 year old twins. I seemed to do laundry constantly until I made a schedule! The worst part was we always seemed to scramble on the weekends to get clothes ready for the week. I really wanted a schedule that left the weekend open. Sometimes, I throw a load in, but I don't feel I have to. We also alternate the younger children's sheets. Boys one week, girls the next. They usually have a bath before bed, so I don't feel they need washed every week like the older folks in the house. Tina has shared her laundry schedule and some advice and schedules for her eight children (soon to be nine) for household chores. I don't do laundry (even though I do enjoy doing laundry & washing dishes - which I don't get to do either)). Laundry, dishes and all other chores are our children's responsibilities - I am their manager to make sure they learn responsibility and how to complete a task at hand (skills they will need daily no matter what the Lord has planned for the rest of their lives). We homeschool our 5 girls and 3 boys, ages 15, 13, 11, 9, 8, 6, 4 and 2. Part of our daily routine is morning chores. Along with all the other chores to be done, laundry is rotated between children every 5 weeks (Monday to Sunday). Laundry is only included in the 13, 11, 9, 8 and 6 year old children's responsibilities. Our 15 yo girl is taken off daily chore responsibilities and now is responsible for dinner planning, preparations, and making every day which keeps her busy and I or the next girl (11yo) fill in to give her a break at times and to help teach the younger to cook as well as her older sister. We wash 1 load every day (on occasion 2 if necessary). We do not sort laundry, just wash everything from yesterday in one load on cold. Weather permitting we hang the laundry outside and it is folded and put into either the boys or girls rooms and is the owner's responsibility to put them away before bed time. We have been doing chores this way for at least 5 or more years and it has been working nicely. I am always interested in how others do it and may make revisions based on ideas that may make our system even better. Wow, thanks Tina for sharing your laundry schedule with us, along with more information about how you allocate chores amongst your kids. I have to say your system sounds quite inspiring, and well thought out. I also admire how you are teaching your children all types of chores and how to do various household tasks, because that will really help them feel ready to do it once they have their own families. If anyone else wants to share their laundry schedule, whether you have a big family or not, you can share it here, and the best ones will be published on the site. 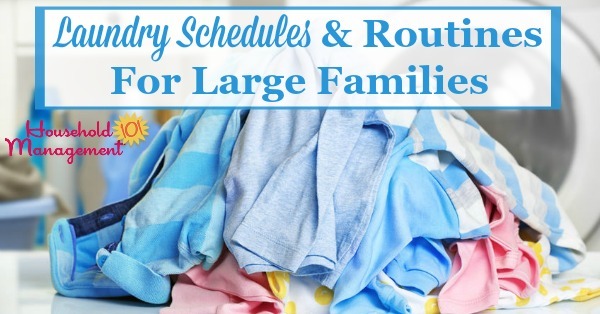 In addition, don't forget to check out other laundry schedules from lots of other women and mothers, from all kinds of situations, including those who work outside the home, in the home, homeschool, have very young children, and even those who have to do their laundry at the laundromat. I have six kids and each one has their own day once a week. Ages from 3 years to 15 years old. The older ones know how to do laundry but I do the washing and drying, they ALL put their own clothes away (I help my 3 year old fold). Once the basement is finished then the older kids can go back down and wash their own. We are a family of 5 so we each have a day of the week then Saturday is towels and Sunday is bedding. Been doing it this way forever. It really works well. If each family member has a day how many loads does each family member usually have once separated? Seems like a lot of waste. We're a family of 5 and I can do everyone's laundry on Saturdays with about 5 or 6 loads total, including towels and sheets, AND schlepping it to my parents. I have 5 kids, each has a laundry day of their own so it is easier to sort after, on their day they throw their clothes down the chute (which is a lifesaver), shirts and pants all get hung up (I have a rod in my laundry room which is another lifesaver) and they are responsible for taking them back up to their closets. I don't fold/match socks, since my girls like to wear mismatched socks anyways (apparantly a trend thing), and my boys all have the same exact socks, so I just give them each their own sock basket in the mud room so on the way out they can grab a pair, saves a ton of time. I have 7 children and a husband and work a full time job. I am super particular about our clothing having no stains or wrinkles (without ironing). I do laundry every day and believe that is the secret. I dry sweaters and pants for a few minutes and them hang them out to dry. I never have more than a load of dirty clothing when I leave for work in the morning. And I fold at night or early in the morning. We are a house of 10. 5 of them under 10. My "secret" is to run a load every morning and every night. Our dirty bin has 4 dividers and is on wheels. Very easy to see what load needs priority. All the kids are responsible for putting away the clean stuff in their drawers. Family of 8 that includes 15 month old twins. I wash bedding, colored towels, jeans and colored clothes on Monday. Wednesday or Thursday I was a load of jeans and colored clothes if needed. Saturday I wash jeans, colored clothes and whites. My oldest son folds and puts away all his clothes. My 3 girls only get their play clothes to fold and put away. I fold or hang mine, my boyfriends, the twins and the girls school clothes. We are building a house and I will have a room for nothing but clothes that I will manage because no one here seems to be able to put together an appropriate outfit. 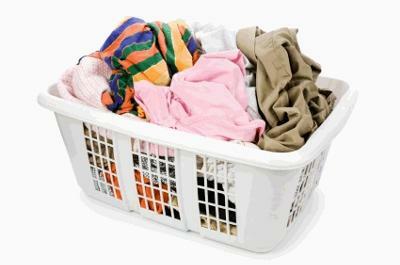 You don't need a schedule of when to do a load of washing, you need baskets that equal a full load of washing. Check daily, if the basket is full it gets washed. If it's not full then don't wash it. Full loads save your time and money on water, power, and detergent. A very good article. Routine is essential when you have a family. Did you know that a dehumidifier can dry laundry as effectively as a tumble dryer and has a lower running cost? Family of 6 - how I cope with Laundry! We are a family of 6 here, me, the man, Miss 16, Master 15, Master 14 and Master 12. We both work full time so here, no laundry is done during the week. Today is Saturday so my first load is all the school uniforms. These goes straight onto a clothes horse for drying (even in nice weather). Next is socks and undies - these go straight in the drier and then into tubs where this kids sort their own. The 3 boys each have a colour for undies and socks that I always stick to so they are easily identified. Next load is tops/tees, usually 2 loads at a minimum, then pants/jeans, a load of my work clothes which go straight onto hangers. My kids all have baskets in their rooms and on Friday night I tell them to bring them to the laundry - I don't go chasing it. If it's not in the laundry it doesn't get washed. In the current weather my house has 2 big clothes horses in the family room, but the 'system' works for us, mostly! anyone from the uk on here? We usually get different weather in the UK, so washing schedules can be different from the USA. Tumble driers and radiators usually play a part, and our kitchens are smaller and no laundry rooms unless you are rich over here, so not so much room to split and store laundry stacks. We are a family of 6 (children aged 8-2). I do have a routine for my washing, and try not to do any over the weekend. 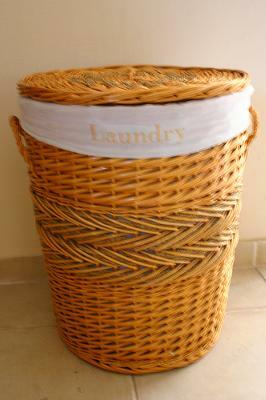 We sort the dirty clothes into 3 separate compartments of our hamper; whites, darks and brights. The dark and bright loads fill quickly and there will be one load done each day of either of them. Plus this routine below, which works out to 2 loads a day. At 4:30pm each day, myself and the 3 oldest children (8,6 and 4yr olds) all gather in the laundry and fold till its all done. I put away the following morning. I like the tips I've read from fellow busy Mums! Hi, I am asking for advice because recently I went through a very difficult time in my life and suffered with undiagnosed depression. I finally got myself to my doctor and am now getting the treatment I need, but my home has suffered as a result of my illness. I have laundry everywhere. Are there any tips to help this overwhelmed single mom to 3 get caught back up so I can try your wonderful laundry schedules? Thanks. There are currently 15 people in my home. Laundry is set up as follows. Everyone does their own laundry and adults do towels and bedding during the day while all kids are in school. I am a mom of four children, aged 16,13, 9, and 6. The biggest tip I will give is not as much about schedule as how you are set up. If you have the opportunity now or in the future, do consider getting your laundry facilities set up on the same floor as your bedrooms. About a year ago my husband managed to move our laundry up to the large hallway outside our bedroom and it has made the world of difference. I find it so easy to keep on schedule now. It is a constant reminder at the beginning and end of each day, and easy to access. Furthermore, our laundry line is hung from the upper balcony so this saves me lugging super-size loads of wet laundry across the house and up 17 steps just to air it naturally. Secondly, where you live can make a big difference to how you prioritize your laundry washing. We live in an area that pays far more for any energy used on weekdays between 7:00am and 7:00pm. So with that in mind, I put through at least two loads every day and I start the machines as close to 7:00pm as possible each day. Often I will have the load(s) prepped during the day and then just hit the button after dinner to get things rolling while we are working on the bedtime routine with the younger kids. If the weather is nice I will put through two loads of wash and leave them wet for the next morning. If it is winter or they are calling for storms I will continue the loads straight through to the dryer. The next morning I will fold them while the kids are getting out of bed and asking questions about outfits, etc. It works very naturally to be folding in the hallway while speaking to each child about the first part of their morning routines. It only takes that long to fold two loads and then it is done till the end of the day again. If the weather is nice enough to hang the laundry I will do it as close as possible to the beginning of the day (and let’s admit, there is something wonderful about that time alone outside). At the end of the day I will take it off and fold it while directing the bedtime routines. By the time I am done, they are ready for prayers and cuddles. Each child is responsible to take their folded pile and put it away properly in their room. One more very useful tip I will pass on: My kids are at the age that they should be very conscious of my time when tossing things in the laundry. It is natural for a child to toss clean clothes (sometimes even still folded) into the dirty laundry if they are rushed while cleaning or not paying attention. However, if I catch clothes that obviously didn't need a wash that child owes me a load of laundry. Same rule applies for damp towels found on a bedroom floor picking up germs when they could be hung and used again. I certainly believe it is imperative that we teach each child how to do their own laundry by the time they move out but in terms of everyday schedule during the school year, this is our normal. My daughter has 5 girls. From an early age each girl was given a day to do their laundry. 2 loads each if needed. Then she did a load of towels, or whatever household laundry needs. Saturday and Sunday was her and her husband's day. When her girls had swimming during gym at school she would do swimsuits and towels if needed on Sunday. She has a large capacity washer. And now that the girls are getting older she encourages some line drying. But that's difficult because she lives in New York! I never have to sort anything because I have a different basket for each type of laundry. My washer and dryer are on the same level as my bedrooms so I only have to take towels for the kitchen, powder room, and downstairs bathroom up and down stairs. 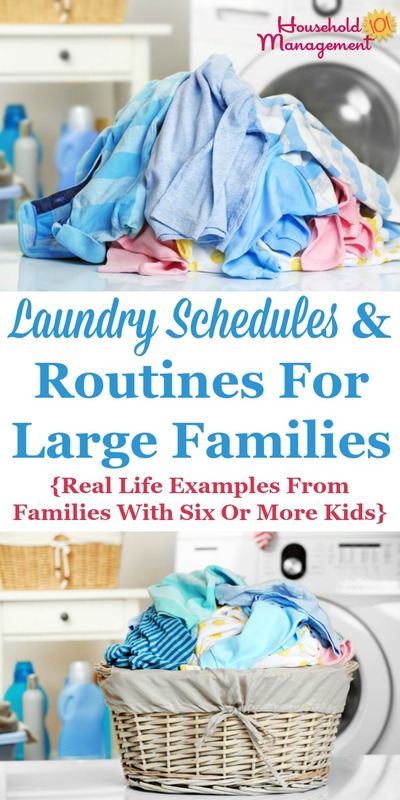 I used this same laundry schedule with 5 kids & it worked great for me too! I'm a mother of 5 and I used to do the laundry this same exact way. Each person was assigned a day of the week (my husband & I shared a day so I could have Sunday off!) It worked great! When the kids got old enough to do the laundry on their own they continued with their assigned day and that worked out pretty well also. In addition, to keep things a little more organized, I bought each boy a different style of socks so I would know who they belonged to. One boy wore black, one grey, one white and one white with grey toes & heels. It worked for us, with 4 sons in the house. One thing I also did when we had multiple bathrooms was to give each child their own color set of towels. I tried to use that child's favorite color or as close as I could get to their favorite color. It sure made life easier to know which bathroom the towels went back to! I suppose I could have just used the same color towels through out the whole house, but this made each child feel like they had something special of their own. In a large family, where hand-me downs are the norm, that's really important! I have 6 kids all grown now however one of the most interesting thing I ever heard about doing laundry was that in Finland I think one room in the home housed everybody's clothes. The folding table and ironing board was also kept in that room. Each family member had an allocated hanging space and drawers. No carting clothes from room to room and no sorting. Makes a lot of sense to me.